Prince Valiant began as a Sunday comic strip in 1937, created by legendary artist Hal Foster. 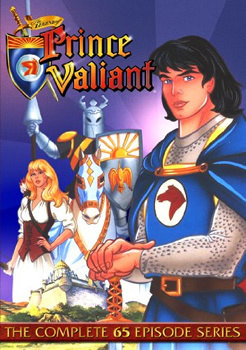 In 1991, the Family Channel began airing The Legend of Prince Valiant, an animated series based on the strip. The TV show tells the story of an exiled prince who is on a quest to become one of the Knights of the Round Table. As they travel to Camelot, brave Prince Valiant, feisty Rowanne, and woodsman Arn bond in their common desire to defeat practitioners of evil during their treacherous journey. The strong moral center of the series earned The Legend of Prince Valiant the Humanitas Award in 1993 and three Silver Angel awards. The voice cast for the series includes Robby Benson, Michael Horton, Noelle North, Alan Oppenheimer, Efrem Zimbalist Jr., Tim Curry, Samantha Eggar, James L. Avery Sr., and Dorian Harewood. The Legend of Prince Valiant has recently been released on a five-disc DVD set that includes all 65 adventure-filled episodes. Additionally, the set features interviews and commentaries from producer David J. Corbett, writer Brook Wachtel, and voice artist Noelle North. You can purchase Legend of Prince Valiant from Amazon. You can also try to win a copy here. To enter, you need to merely post a comment below. Be sure to leave your email address in the comment form so that we can contact you with the good news if you win. You can enter once per day. If you’d like an additional chance to win, leave a comment on our Facebook page under the wall post about the contest. If you don’t have a Facebook account, you can email us as another way to enter. Guidelines: This giveaway is open to participants with a United States mailing address only. (International readers can enter if they have a friend in the States who can accept their prizes by mail.) Many may enter but one person will win. You must be 18 and older to enter and no purchase is necessary. Contest ends July 18, 2010. UPDATE: Congratulations to Jerry who has won this DVD set in our contest. Thanks to everyone who entered. Stay tuned — more contests to come! I loved this show when I was young. Hi i was totally addicted to this series! Still loving it! So I gues this means I enter for the give-away 😀 ! a prince of a series! My four kids would enjoy this. Please accept my entry into the “The Legend of Prince Valiant” DVD giveaway.